NOTE: Newcastle runs with more greenery can be had in the gigantic Town Moor (north of the center) and up the lovely wooded stream valley of Heaton Park and Ouse Burn creek (east of the center). Newcastle is a fascinating town. It combines a lot of Georgian-era elegance, modern redevelopment, and a revitalized riverfront full of history. One of the main streets in the town center, Grey Street, has been voted as one of the most beautiful in all Britain. And indeed, with its solid line of Georgian-style stone buildings curving down towards the river, it's one of the most impressive you'll ever see. When I first went down that street, I was captivated. You can see how wealthy the town was in the 1800s, when it was a big mining- and ship-building center, with one company headquarters building after the other filling the town center. 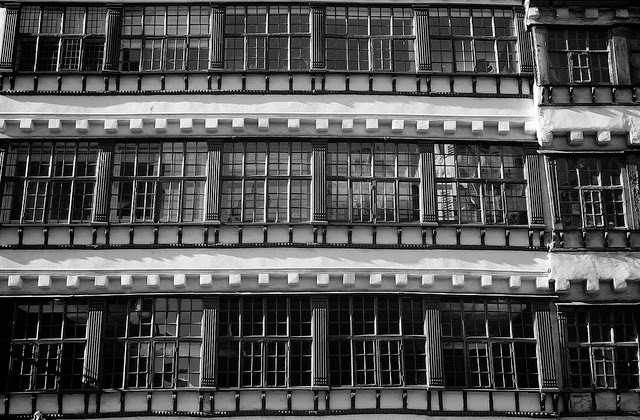 Nearby Mosley Street was first in world with electric lights, in 1879. The world's first commercial locomotives were also developed and built here. 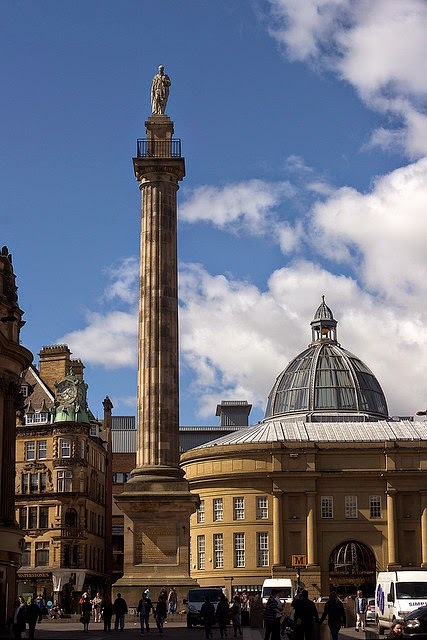 Beyond the history, Newcastle is a fun place to enjoy the evenings: the streets are full of party-goers, with women unsteadily navigating the cobblestones in their high heels while wearing just a summer top while anyone sensible buries his hands into his heavy coat. 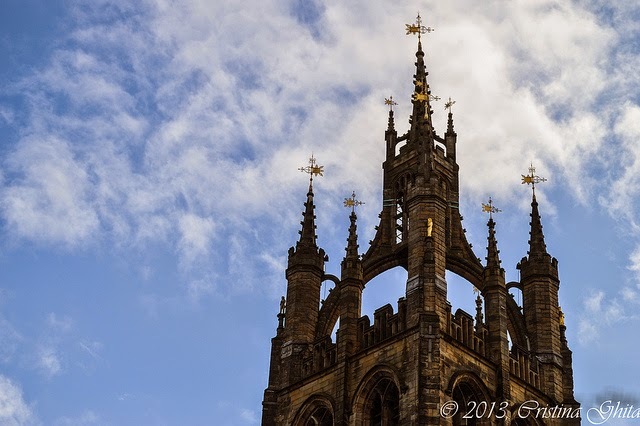 We'll start the route in the heart of town, at the base of Grey's Monument. The monument to Earl Grey was erected to commemorate his efforts in reforming the British electoral process in 1832 and making it fairer: certainly a good reason for a monument, if ever there was one! In 1941, though, a bolt of lightning blew Grey's head off, and it had to be replaced. 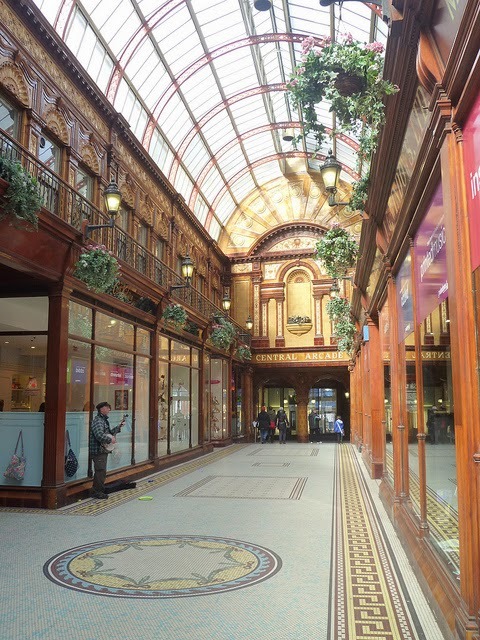 Along the south side of the monument square is the 100-year-old Central Arcade, a beautifully detailed old shopping arcade. So, let's head south down Grey Street, running slightly downhill. 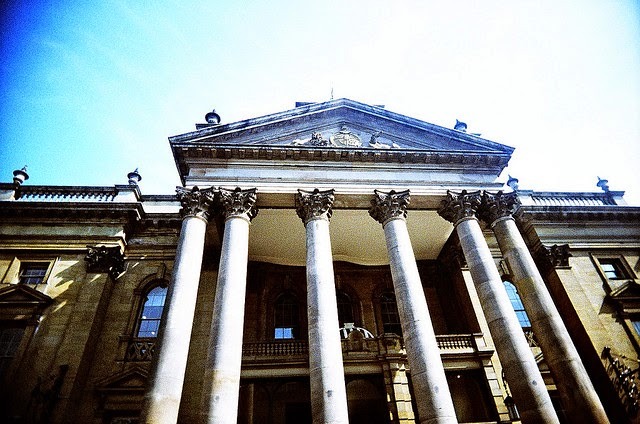 You'll quickly pass the elegant Theatre Royal on the left. After crossing Mosley Street (it still has its streetlights, so it must have been a good idea! ), the street name turns into Dean Street. After going through the forbidding, lofty arch of the railway viaduct, you continue running downhill at an even steeper angle, to the River Tyne. The blue-metal Tyne Bridge will be directly beside you on the left, as you pass some interesting old pubs on your right. Just before the river, on Sandhill, you'll go by the oldest houses in town, on your right side, impressive old half-timbered buildings. We'll run by them later to have a closer look. Keep running next to the Tyne Bridge until you hit the river, then turn right and run along the quay towards the old red-and-white Swing Bridge straight ahead. Take the stone steps up to the bridge. NOTE: You could continue running upriver along the promenade for another two kilometers if you want to add more distance and more of the Tyneside atmosphere to this run. Now cross the Swing Bridge, going under its overhead lighthouse, just above your head. This thing is a beautiful piece of Victorian engineering, built in 1870s. The Swing Bridge rotates around the center to let ships pass, and is hydraulic-powered. The Romans had built the original bridge here, the Pons Aelius, to aid forays into Scotland to the north. Two stone piers from the old bridge have been discovered on the river bottom. 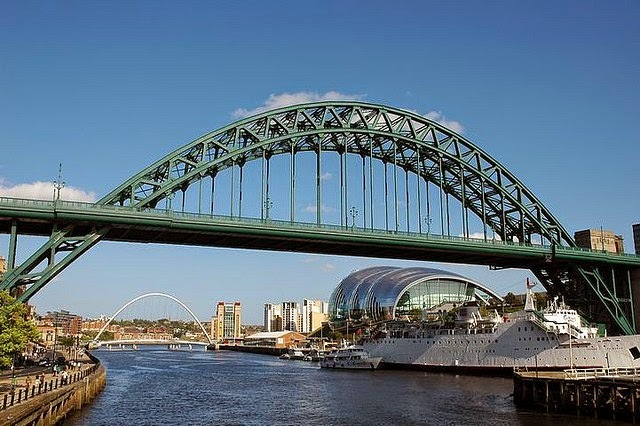 The Swing Bridge is sandwiched between two much higher bridges to either side: the Tyne Bridge is to the left, and the double-decker High Level Bridge is just upstream (to the west), built as a combined railway- and road-bridge back in Victorian days. There are a few more bridges further upstream to the right. 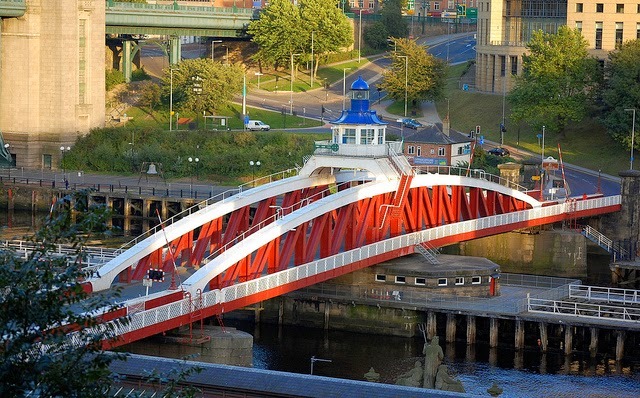 Cross the swing bridge to the town of Gateshead on the other side, where you hit the 1-km mark, then turn left onto the first street, Hillgate, where it goes under the Tyne Bridge. If the Tyne Bridge looks familiar, it might be because it was built by same people who built the very similar Sydney Harbour Bridge. Now run directly past the modernistic curves of the Sage Gateshead concert center. Right after the Sage center, you'll come to the delicate arch of the Millennium Bridge on the left. Cross its curving surface (it tilts upwards when ships come) back to the north side of the river again. This is another fascinating bridge, but with a very modern touch this time. Now, turn right (eastwards) to run past a stretch of restored riverfront with nice waterside flats. This part of the run along the north bank of the river follows a bit of the Hadrian's Wall Path. The Wall Path ends a few kilometers east of here, but continues westwards all the way to the west coast. The Roman-built wall followed the bluff just north of you. Turn around at the point where the path is blocked by a stream emptying into the Tyne, at the 2.5-km mark. 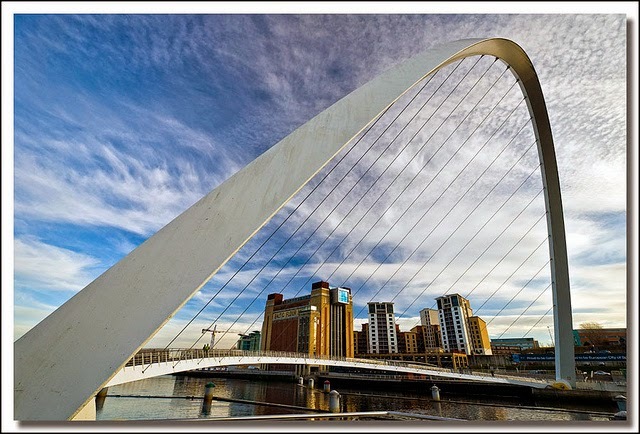 Then run back westwards along the Quayside promenade past the Millennium Bridge and more modern buildings, to the Tyne Bridge again. Run under the bridge, then turn right to head up to Sandhill, with its ancient houses just ahead. Now turn left onto Sandhill and run just past where Bridge Street turns left to go over the Swing Bridge. But turn right between the houses to go up the steps towards the castle above. NOTE: If you don't want to head up this lonely (but atmospheric) stairway), head back uphill to the railway arch on Dean Street, then bear left onto the street called Side, which also takes you up to the castle. 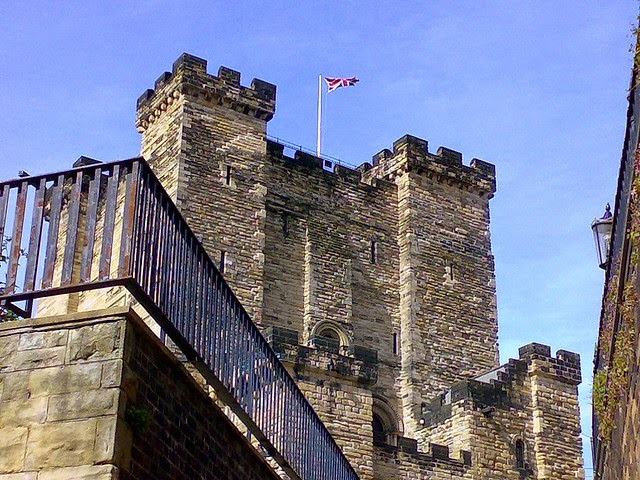 You come out from the steps at a square next to the castle keep (defensive tower). The elegant Vermont Hotel is next door. This is the 4-km mark. 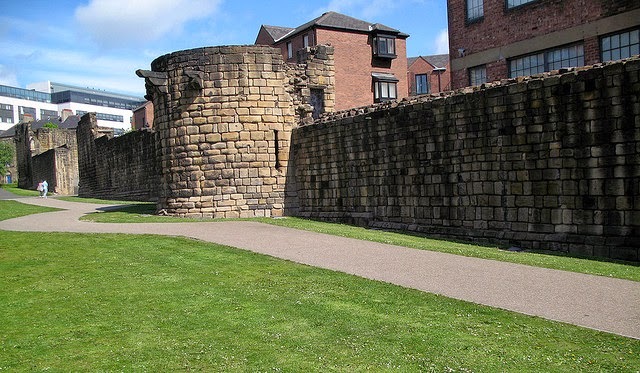 The Norman-era castle is on the site of the old Roman fort, near the eastern end of Hadrian's Wall and guarding the site of the Roman bridge. The railway cuts right through the castle site, unfortunately, behind the keep. So take a look around and then run around the right side of the keep, and go through the archway under the railway, and you'll come out at the next part of the castle, the Black Gate. Head out through the gate and onto St. Nicholas' Street, continuing northwards towards the beautiful crown-shaped tower of the smallish-but-beautiful cathedral. At the cathedral, turn left onto Collingwood Street. This street is a bit busy, but brings us to more interesting historic stuff. You'll go past a monument and then another nice old church: St. John the Baptist. Continue on this often elegant street until you get to Cross Street, where you head diagonally up the narrow alley next to the old city walls. Stay on the inside of the wall, running along W. Walls. At the first round tower, turn right to run onto Blackfriars Court, between some modern row-houses. You'll come out onto Friars Street with its ancient stone monastery buildings. Now turn left to head back to the town walls, and continue running northwards along the outside of the walls in the little park beyond. At the northern end of the western walls, at the gate to Chinatown, you'll see the massive St. James' Park stadium of Newcastle United ahead. Turn right onto Gallowgate and run by the old graveyard of St. Andrews. Now continue straight ahead at the big intersection and run through the arch below the modern, blue-glass building, part of a shopping center. OK, this is the ugliest spot on the run, but we're almost done. You'll now go by elegant old Eldon Square, and then, in a few steps, you'll be back at Grey's Monument. So now it's time to clean up and join the party-goers in one of those great old pubs for a pint or two of Newcastle Brown Ale!